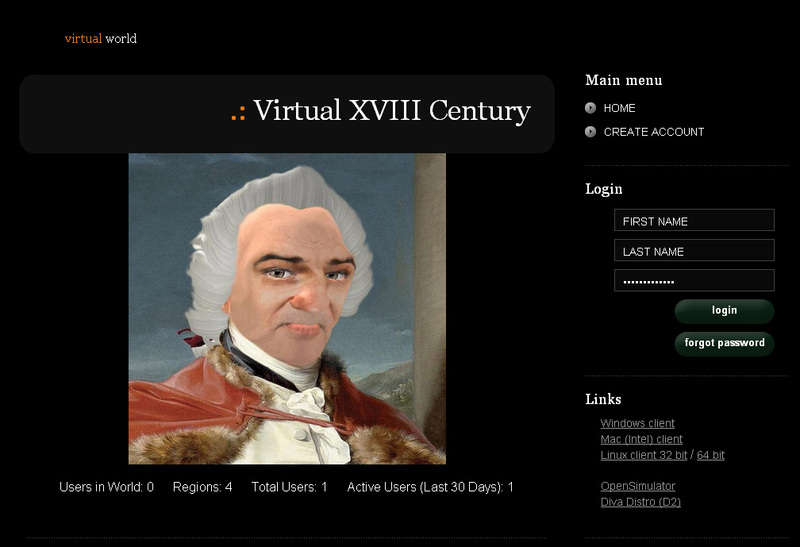 VIRTUAL XVIII CENTURY - Blog! 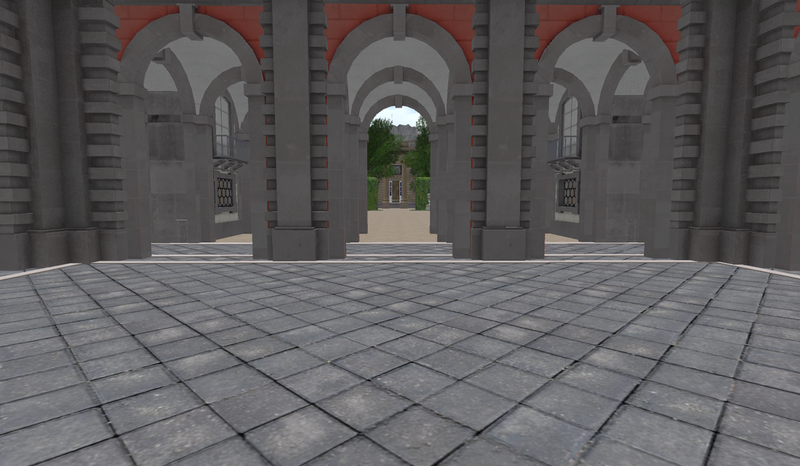 The Royal Palace of Aranjuez in OSGrid. This RP has been modified an rebuilded the environment. The cause: La Granja is very nice, but really Small as structure to develop a good RP. Resumed: too much gardens and a very little palace. 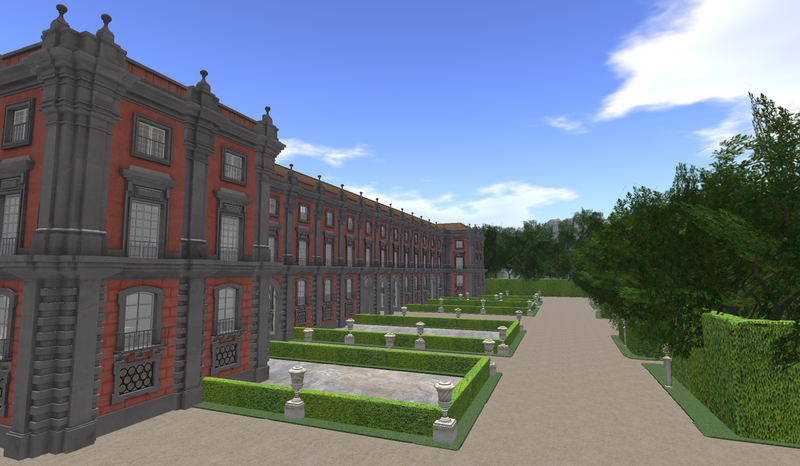 Today, we have a enormous palace and his gardens with various skyboxes for place a hunting forest and a freebies place. -Dancing system: I'm preparing a good minuet animations in BVH. -Weapons: we have various rifles and pistols using the Myriad RPG System of Allen Kerensky. -More appartments: "the Court could be your home", all ACTIVE members will get his own space into the palace, furnished or unfurnished rooms. 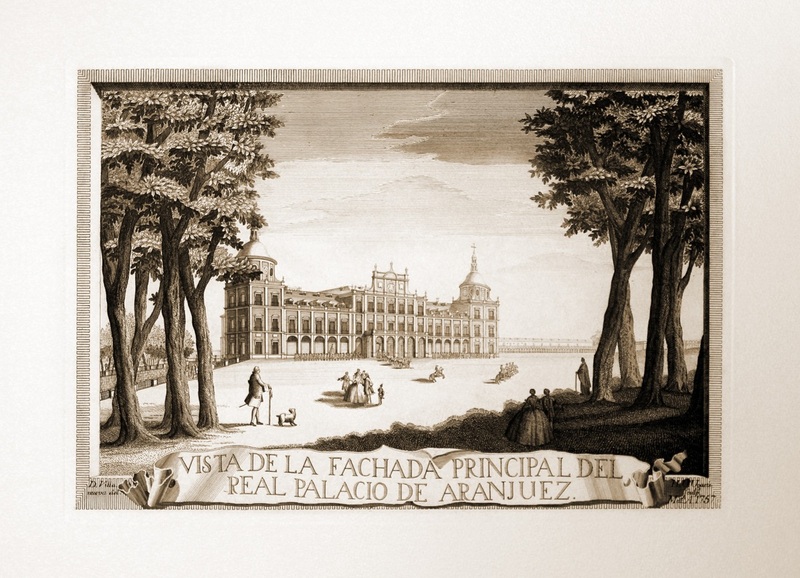 The Royal Palace of Aranjuez was a "Royal Place" since 1506, when the Emperor Carlos V bought Aranjuez to the Masters of the Santiago's Chivalric Order. 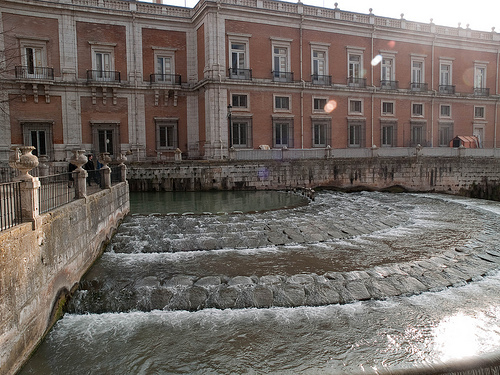 Since the XVI Century the palace was developed and when in 1700, the first King of the Bourbon's Dinasty came, Felipe V of Spain (before was only the french duke Philippe d'Anjou, but being Prince of the Royal Household of France), Aranjuez was one of the favourites palaces of the court, However, Felipe V prefered to build La Granja de San Ildefonso in Segovia and, when is living in Madrid, reside in the Buen Retiro (The Good Retire) Palace. 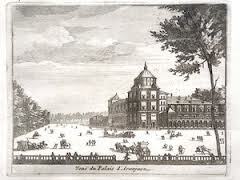 Aranjuez was a great scenery to the court's life and splendid balls and events, but was in the following reign the Fernando VI age, when Farinelli will organize great moments and convert the spanish court in a important cultural capital of the rococo european. 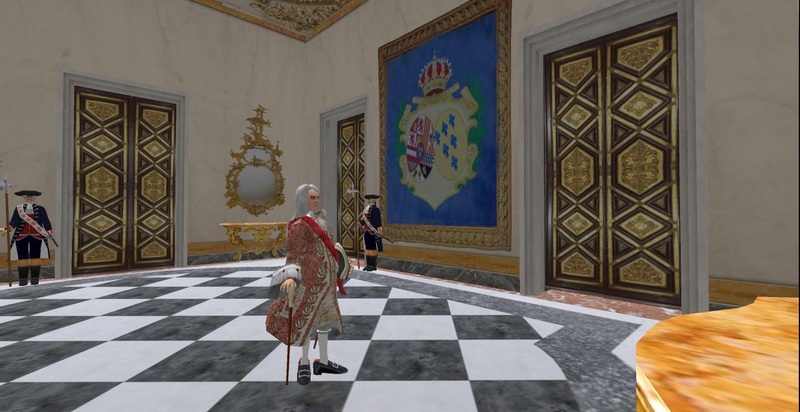 If you wish to visit or take a role in rou RPG of "The Court of Felipe V, 1720's", feel free to travel to Illustrata in OSGRID. Two weeks ago I started a new journey: first was a little plan, later was the creation phase and finally get live to this idea. One of the most dificult step is where run my console or where is my grid. I spoke here about create my own grid, something imposible now because of his cost. Later I was thinking in Kitely, but Kitely is a crazy miracle yes, but is not exactly a grid. Is a accesible cloud, and soon, I know, much more. But I chose OSGrid, is a versatile grid and I can elect my server or, perhaps, my SIM provider. Is a free grid, full of regions, with a excelent philosophy nearest of mine. Now, I'm part of a little group of players and La Granja de San Ildefonso, that far plan, that difficult creation process, is now a place full of life and others can enjoy my dream. The best part is the money`s absence. The cost of a region there is cheap, all runs very well and this region could have a long life. Can I regret this decision? No, Opensim brings me a complete virtual world and spend time in a empty region, into my computer, alone, creating, was the best idea for my free time. Opensim is, almost, part of my life and now I can understand to some bloggers explaining the magic sensation of have something like a virtual life: perhaps the Platon's perfect world. And Second Life could be the sensible world, the hard and dirty money, a lot of hookers. However, Second Life was a marvellous idea until now, when is almost sunk. I can't understand why the people is playing Minecraft after visit a nice region of SL, perhaps there you don't need pay one thousand dollars for get a region and three hundred dollars monthly, thought Minecraft have horrible graphics, but his players are happy for now. But I guess that is the same song of SL criticism. Good bye, Second Life! Now, I have a new challenge: how to create a good and funny roleplay...With my theme! 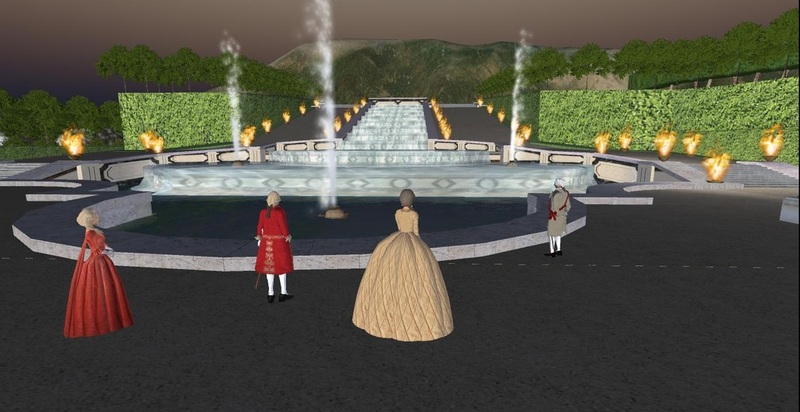 I decided to publish all around this week and continue working in OSGrid. HypergridII is still coming and I can not stand the idea of another unfinished project only because the protection is not still optimal. Don't worry, because I will offer freebies when Crista Lopes finish his HGII, because my RL don't let me time and because the gowns in process are coming slow. However, the environment is almost ready. This is the entire space, under construction. I had to use the simple trees of Opensim, because each bosket demands around hundred trees. Can you imagine the lag using sculpt or mesh trees? A hell! In the screen: a lonely girl is walking around the "broderies" under the moonlight. She's Luisa Luisa, my dummy, resting of the work. I hope offer that work very soon! Vacations are finished for me. 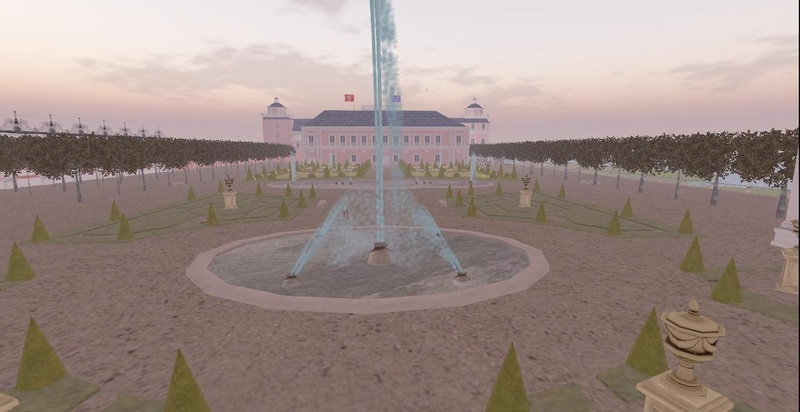 That was time to work in a old project almost finished that I hope can publish on OSGrid around september. I did a long travel in the throats of Blender 2.5 and I hope show the results in the next post. 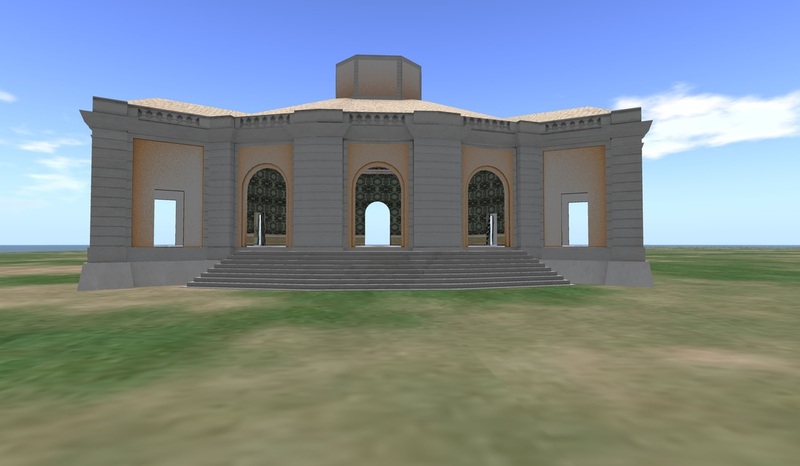 Really I had the complete model of my project rendered on Unity3D, the problem was adapt the mesh to use in Opensim, specially in OSGrid if I follow my plans. In the picture: the Royal Palace of La Granja de San Ildefonso (Segovia, Spain). This was my first scene for Unity3D. Where six months working on the facades and the enormous park of the palace. Now I simplified the mesh to use in Opensim. It's my most beloved project, so that I decided protect it. Anyway, I have reasonable doubts about OSGrid and the protection of my work, so I decided publish when Hypergrid II is ready. Naturally is stupid pretend OSGrid as a secure place, however I have notices about a serious control and DMCA protection by the grid's managers. Of course I assume the risk of publishing; if you feel dislike the illegal copies, then don't publish. About the activity into this palatine scenery, I hope prepare a small group of persons to play and reside and solve some absences using NPC's like extras. Could be funny. On the other hand, this could be a good visitable place for "turists" interested to visit a living museum. This idea requires be carefully selecting the original art pieces of the palace and the complementary documentation. While Hypergrid II is coming, I have time to prepare the rest of the enviroment, the welcome zone and the gowns. Without gowns, ladies should be angry with me. And worst: they couldn't to play. So that was all for now. Naturally, I'm very impressed with the recent SIM's leak of Second Life. This expressions of obsolescense only can explain a future changes oriented to become in a strange MMO: less servers, less staff and users very concentrated in the physical space. Naturally it's my guess. I can't think about pure decadence because of stupidity. The Sun's rays are heating the stone of the palace. While the twilight of the day is coming, I'm thinking about my situation here, and then, a little light of this weak Sun seems caress my eyes. Why not? A very absurd part of these light is clearing my ideas. Yes, is time to start something. And, specially, forget the past. 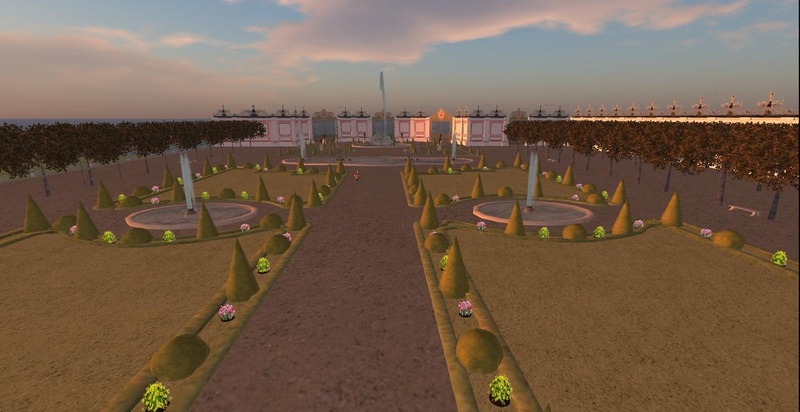 A planetary alignment based in the next Hypergrid 2.0, the Roleplay Myriad Scripts and the image's building, will be the whip to open a Roleplay in OSGrid, the robbers paradise, I know. But must be a good idea abandon my medieval fear to the burglars: the modern copiers. Will be interesting speak about "my roleplay". In my opinion, could be the most boring play if you don't like the age frame called XVIII century. However is the great boring play until if you loves the History. Yes, it's play to "dress the wig", a empty game when don't have a good plot, a good argument. 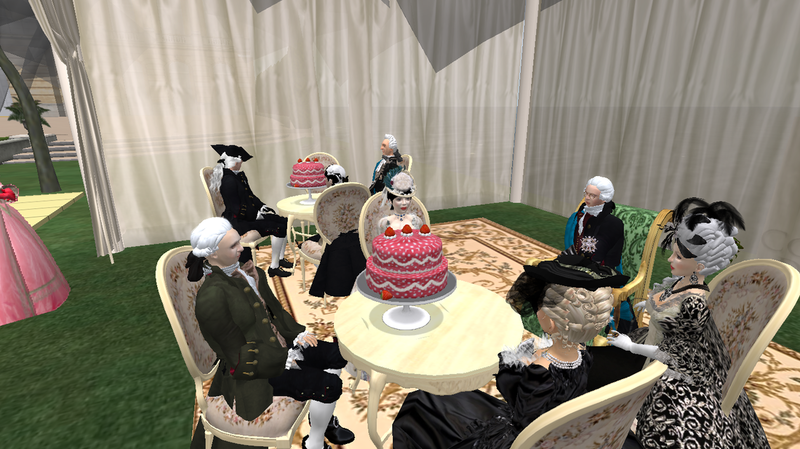 Some "royal courts" in Second Life are playing a frivolous game and other groups are recreating a past age very good. 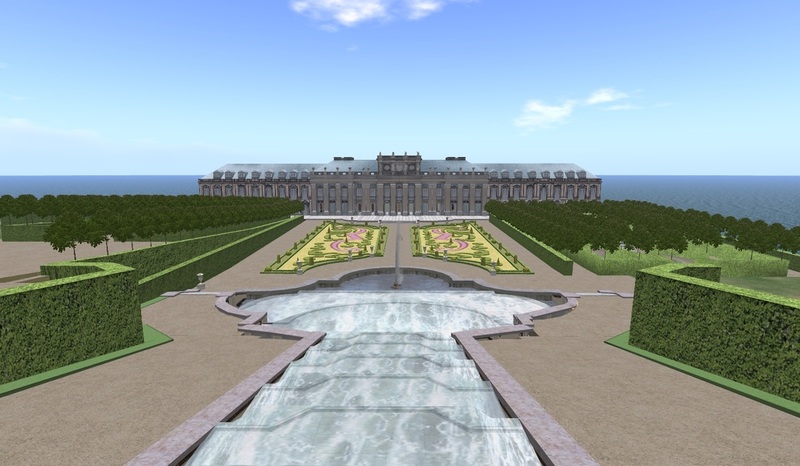 A good example of this last trend is Château de Versailles in Second Life, in addition they have a RP money system and a health metter...Based in eat the enough aliments that are for sale in the RP marketplace. Very good. But still less a plot. Until when I was the master in the old Spanish Court, I never was able to create a good plot to call all players to take part. They where scattered and only attend the main events of the court. However they loved the RP, at least the main ideal of our RP. But for me was boring live -and play- without compass. 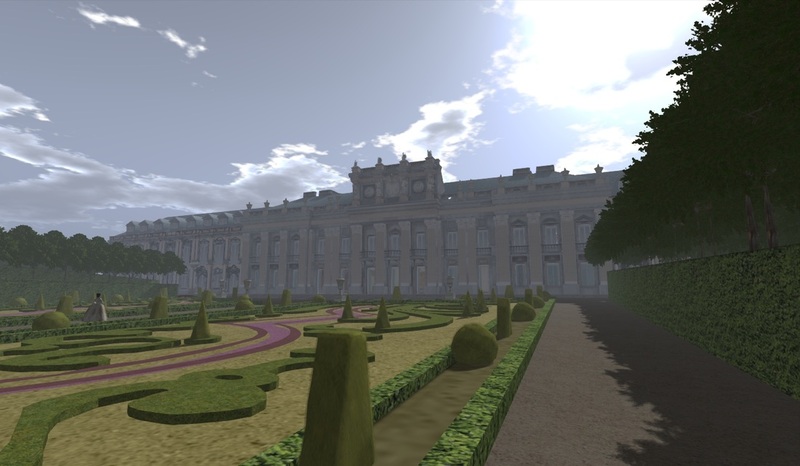 Château de Versailles is the best place to enjoy a good social RP, but is the paradise of the subplot: small gossips faded the next day. Yes, that is the court's life, but Versailles was the alma mater, a power center in the political and economical life of the Kingdom of France. Is needed a "power fight" game. Then, my actual project is not part of a complicate mesh structure, or a enormous and empty palace. Is prepare a good RP argument, in addition, use the Myriad's RP scripts, adapting the HUD and metters to my purposes. 1-Historical context (a small period, like Seven Years War or another similar moment). 2-What could happen if? The RP action like a change's vehicle. 3-Main characters (they are the primary leaders of the diferent factions, and can change). 4-Secondary characters (they have diferent tasks, his position can increase of decrease because of the game results). 5-HUD, metter, weapons with wealth, special and normal RP objects, NPC quests, etc. 6-Dice's events: the map, the economy, the people's reaction, must be variants to resolve using the dice in a special event to give direction to the game. 7-Subplots: the spontaneous playing develop can promote new and funny situations. 8-Very important, action: because play to drink tea and conspire must have the company of the swords and pistols, naturally in the suburbs, the forest, the battle...All places far of the elegant rooms reserved to diplomacy and silent daggers. Is my first time, as roleplayer, that I prepare a serious game. A experiment. 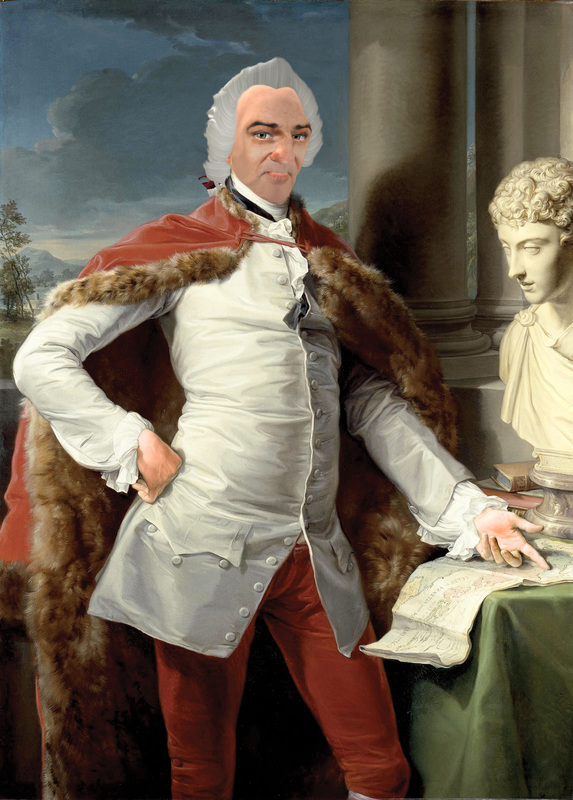 Better than build thinking to prepare a far roleplay based in "dress the wig" and conspire without argument. Perhaps I'm becoming to a metaverse's neighbor v.2.0. This long absence is because I'm preparing some exams in the University. First is the duty. Of course I keep some free time but I'm not able to work into large projects like Capodimonte, my paused Capodimonte. Moreover, I decided create, only for fun and not like a serious matter, a château for my secular character in SL, also part of my life in OS. The old Louis Phelypèaux, duke of la Vrillière and minister of Louis XV. I decided create a residence for him, a peaceful space to rest of the court's intrigues. Also, because, he had houses and appartments in SL, but I prefer don't pay anything and have a lot of resources. If I want a little of travelling and adventure, i have a "new" tool: Hypergrid. Yes, because I had so many problems with my network before I fix all two weeks ago. Now, Opensim is something diferent, is like a grid itself. The diference is simple: my lands are free and my work is completely mine, not only for exclusive use in SL. Crossing the Hypergrid, I have observed the poverty of free contents to the users. I always see the same freebies. It's not so just, because in the last times exist Opensim Creations, with content licensed under Creative Commons, and Linda Kellie, a institution herself. 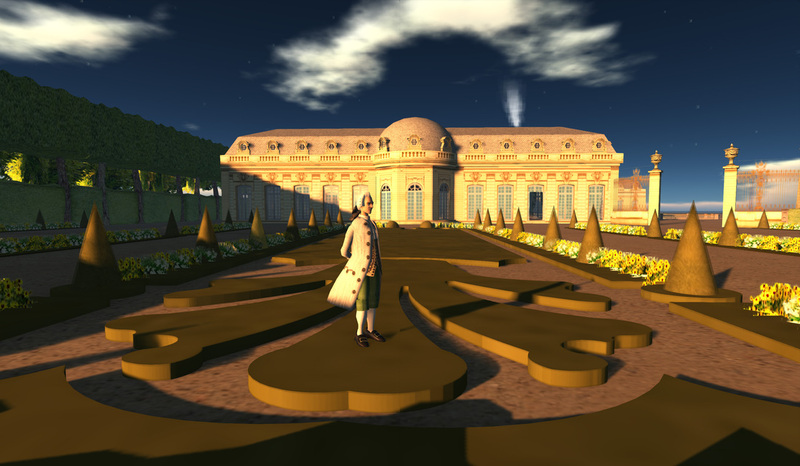 They are working to become Opensim as a rich world and left the old acusation of "empty thing". Then, I'm thinking about register some personal creations under Creative Commons to give my own input, and in adition, increase the number of freebies. This is because sale my creations in SL is not so atractive for me, I'm simply out of SL, is hard live there...All is money. But there are Versailles and some good friends like the only nexus to log there. And, continuing about criticism, Opensim and his grids are still empty. Well this is a middle truth, because the people prefers manage his own worlds into the personal computer than pay to have a world in a private grid, Maria Korolov sometimes says that is imposible create a census about the real users of Opensim, only is posible see the downloads account of OS Diva Canto and Sim on a Stick, and assume that, like me, is normal download the same Zip folder when you have various PC or simply you forget the placement of the last downloaded folder of OS and you are hurry. A tipycal case is, like other users, download the .zip folder and can't be able, or patient, to install. My personal conclusion is that Opensim need get the 1.0 version soon, and don't wait to 2014. This could sound unfair because the developers are fighting against the poor resources and number of workers in the project. I must be grateful, but don't hide my truth. Yes, Opensim need a easy installing system, including network and database, thinking that the medium user should be a donkey or my grandmother. About scalability, perhaps Opensim need a lot of hardware to support fifty users connected in a single region, but this could be fixed with two good news that I clap sincerely, the posibility of keep friends and groups over the hypergrid and the future safe hypergrid. With that horizon is posible continue enjoying Ospensim, I love it and I want prepare a selection of free contents to support this cause. 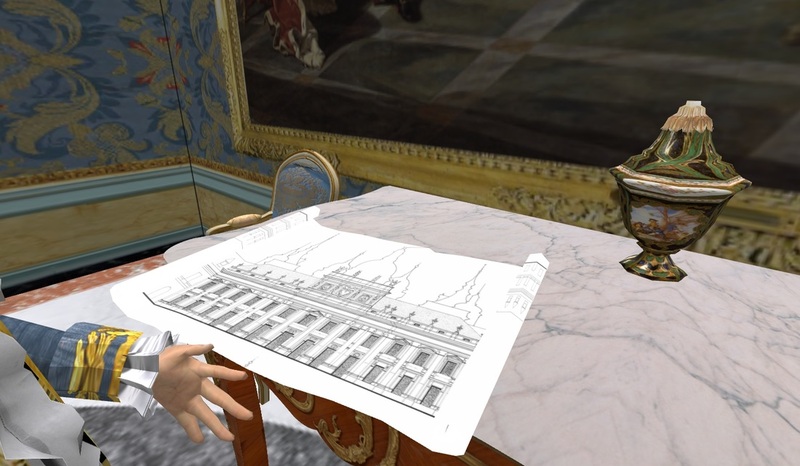 Meanwhile, I'm preparing a library-office to monsieur le duc de la Vrillière, who is very boring while his "soul" is studing in the real life. The pavillion and some apologies! First, my apologies to all, was a long absence because my holy real life -out of this virtual worlds and life- is a normal behaviour but I could writte a simple note to advert. And, look at the pavillion, I finished the first basic structure and it need some frames, windows and decoration. Yes, it is very basic for now, but I'm very happy because is my first building totally made with mesh -also his own physics are running nice!- at least, is the best of my "fantasy" works -projects born in my mind- and I will complete with a mesh park, really I'm building a little scene that will be our office in Second Life. 1-Take care with some small details like corners or soft profiles, the most probably is forget it and this mean that, later, you will back to UV maps wich texture you thinks like finished. 2-Not assign too much materials, I prepared twelve materials to one model and the result is simple: if you exceed the limit the excess material will look transparent. Better unify similar maps into a single material. 3-Prepare precise UV maps is a slow and hard work, then is better simplify the model's details, it is good because the rendering cost is minor. My idea is create the details -like frames, decoration and windows like separate models. Question: "Hey! Can you describe the process and software necessary to do this "sketchup > Blender > Opensim" exportation??" Answer: It is really simple, actually exist a good video tutorial of Neotoy to explain this process, of course you must, in Blender, learn to use the ambient oclussion UV maps. Let me show you some tutorials of my "teachers" and I hope you will learn and enjoy. Thank you to Neotoy and TheASaurus1 to be so generous and share his knowledges with us! I will post very soon, I promise! 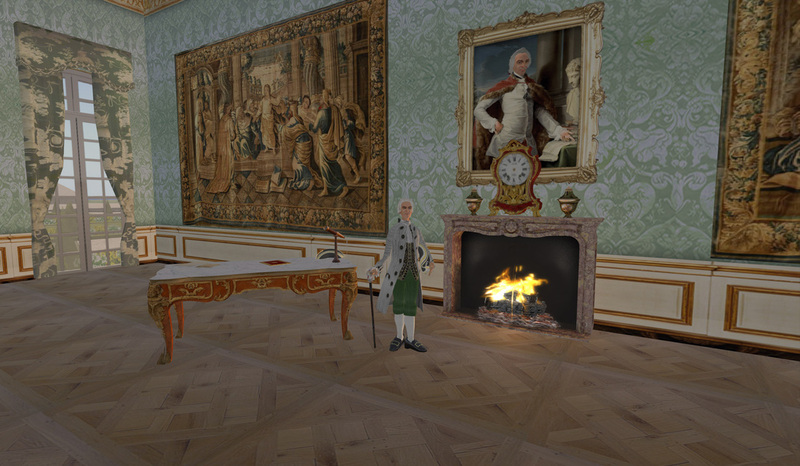 Then, I decided design myself a space to develop a informal court's life in our Naples 1770's using a lot of mesh structures. Naturally, this will be funny because also we will start a roleplay! For now, I have another -and fast- project that I hope finish this week to continue building Capodimonte to open the mini-grid soon. This small palace is product of my personal taste, I decided be today the architect, of course, following the style of our XVIII Century, and is easy, because my architectural taste is really baroque! 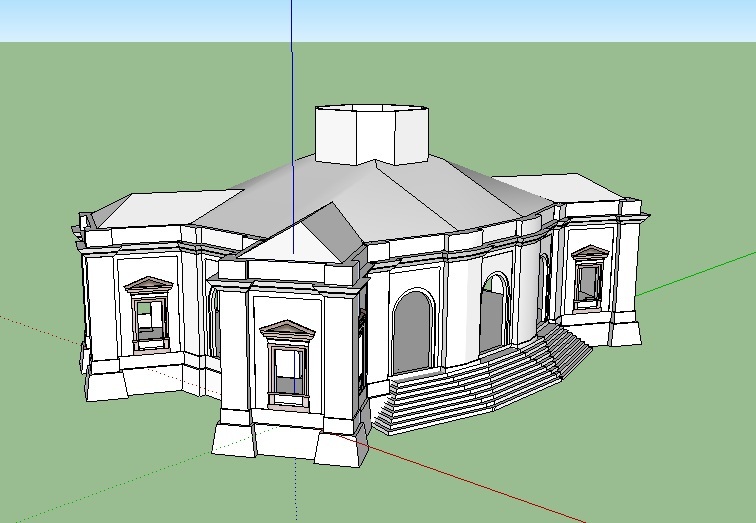 Three days ago: the easy part, design the building in SketchUP. Yesterday: the hard part, mapping the mesh in Blender: is a slow and repetitive work, but the result is worth. I decided quit the windows frame because the work becomes less hard and I could variate the design of each window, or simply change the frames in the future. Well, I'm having fun with it! Also I'm preparing some mesh clothes. Perhaps you could ask me why I'm so obsessed with mesh, let me tell you: because tomorrow could emerge a revolutionary virtual world, perhaps something powered by Unity, or a different Opensim, and convert all my prim-things could be a unattractive work. 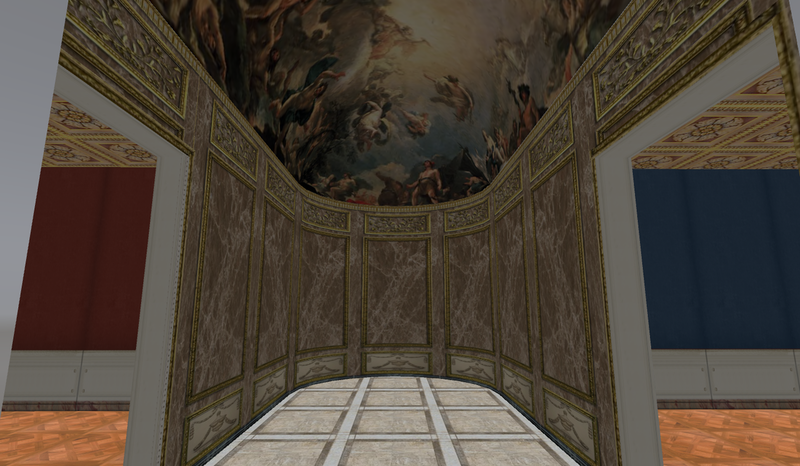 Also, my models could be used in other projects, like some presentation 3D in the University. I repeat again, I'm having fun!!! 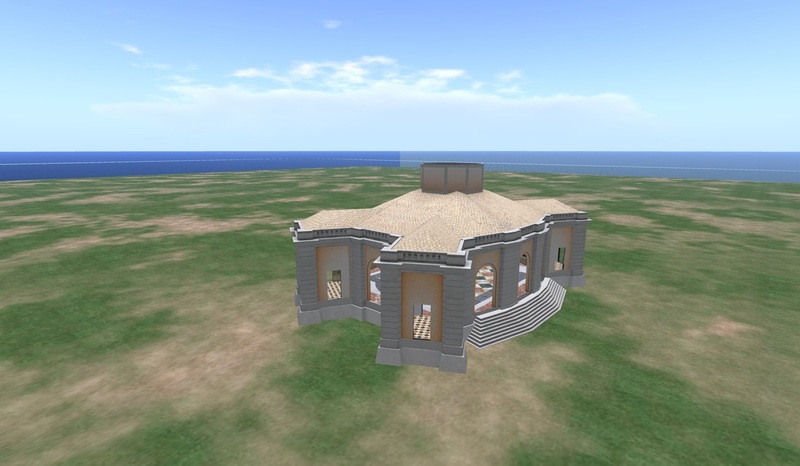 Building in process VIII: a future landing point, house of freebies and a garden's seed. Looking at the next tasks list, I decided provide to a "services" zone wich will be used as landing point and base for get all kind of personal elements, like clothes, AOs, weapons and also a light historical gide to play this roleplay. The problem is that our Capo di Monte is pure mesh, if someone uses mistakenly a no-mesh viewer could be a catastrophic experience, then I decided put a traditional structure of "prims" -mesh models, sculpts and prims are really "mesh", but that's are the differences inherited of SL- to mark a reference point. In adittion, I will put a "giver" in the landing point to warn that a "mesh viewer" is indispensable to play here and how it must be configured. The configuration is easy if you know what is the debug settings console in the advanced menu of the viewer, you must writte there "onrendervolumeLODfactor" and give a value 5100. It is difficult if you are a newcomer. Look at the end, there is a new building! 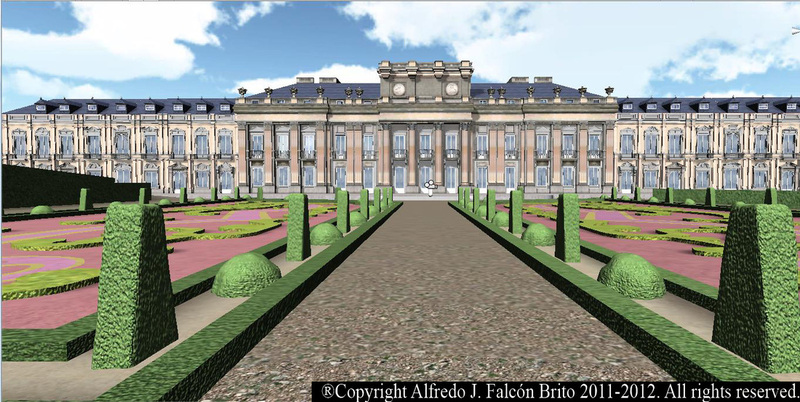 This space will be the landing point, it is not historically correct, I adapted my version of the frenchMusic's Pavillion of Madame du Barry, designed by Ledoux, to convert in a "services" zone. 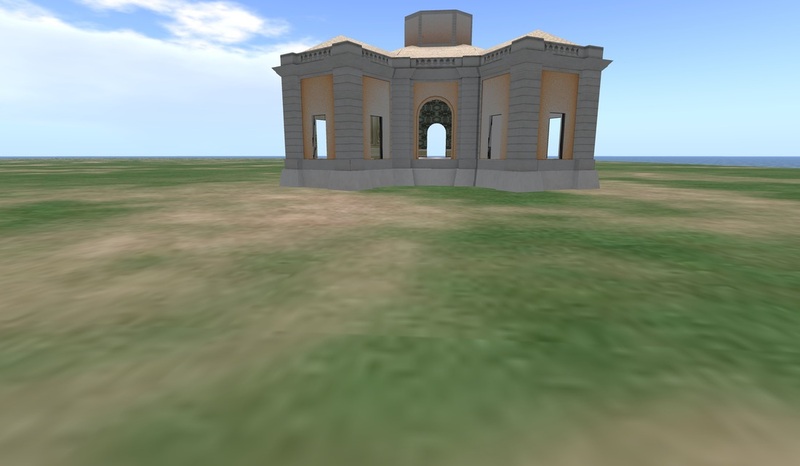 I could design a new building or create a new and historical space far of Capo di Monte to use as landing point, but that could mean lose more time creating buildings when is needed furniture, clothes, weapons, animals, decoration, etc. I hope change it when the urgent tasks where satisfied. 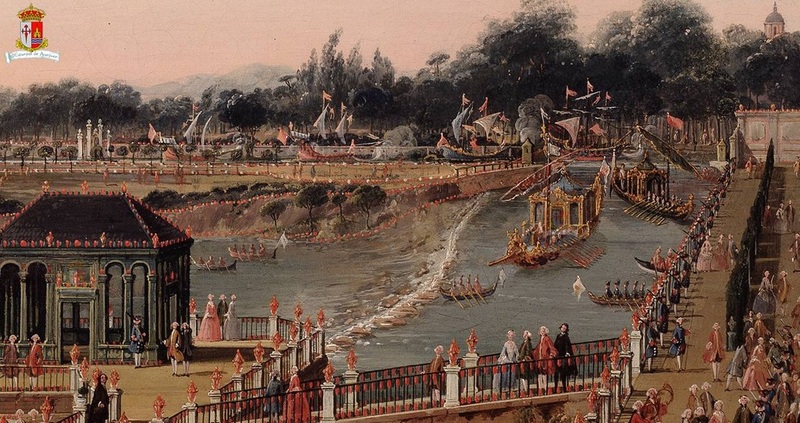 I found a little of information about the gardens of Capo di Monte before become "romantics". Could be something like it, but I must give variety: other threes, flowers, benchs, details, details and details! I confess that is a pleasure take a different matter, naturally, the Palace's stairs are waiting for me to be finished but I want rest a little of all this architecture. Oops! I forget! This is the interior of the "services" zone; red room for get your skin, AO, clothes, weapons, jewells, etc; blue room for get furniture for your apartments in the palace, this have a explanation: I hope offer two rooms in the high floor of the palace to each courtier that want play, then, this room is really needed for provide of the basic kind of stuff to furnish a home. 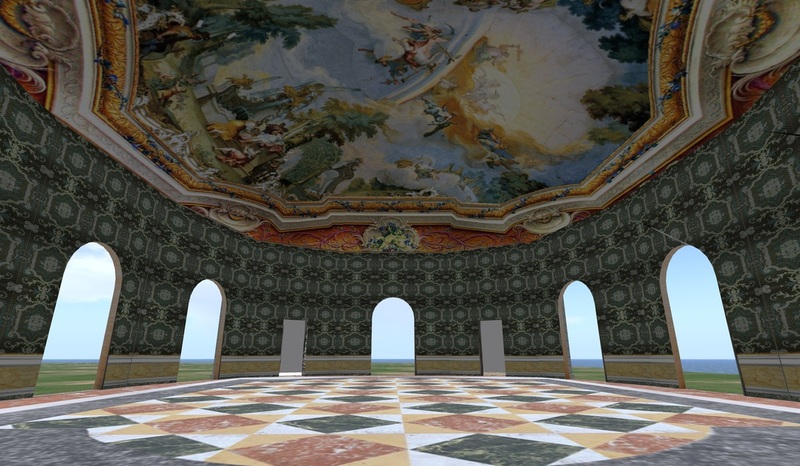 The central room will be the RP's information center, light information that could be completed in a other advanced space into the palace, here you can take perspective about how to play...If you want live here, of course. All for free, naturally. 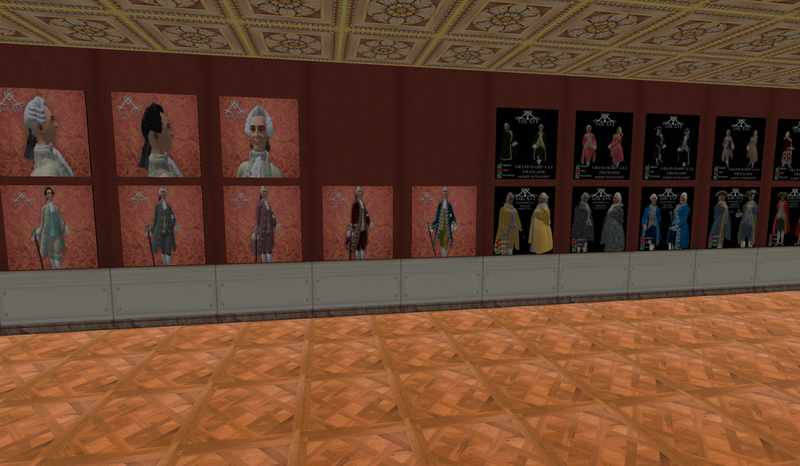 This is the gentleman's wall of the red room, under construction, now I must fill the vendors and create new shoes, wigs, skins, AOs, swords, etc, to continue with the same task in the ladies wall. Watching Capo di Monte between the columns! Well, for now is enough. The project shows a good progress and I'm proud, but continue is my device! Five days fighting against the network! Hello! Yes, that was my life the last five days. I'm preparing the server to open Capodimonte to you, of course will be a test grid but we will get experience not only with the technology, also with the RP, and the needs of a young grid. Well, today I get run it right, naturally I'm need finish the configuring work. In addition, I had a great experience with Ubuntu (the easy Linux distribution) and I must confess that, despite I fall in love with this operative system, I don't have time, for now, to learn how to run Diva Distro using Mono develop. But all are not bad news, because I was able to mount and manage a MySQL server using Linux. But, finally, I decide use Windows Xp for run this test server, like Condensation Land Grid. Hey! Don't look at my nose so fixedly! As you can see, this is the first result of my incursion connecting my grid to out world. And I consider that is a good moment to say thank you to Crista Lopes, aka Diva Canto, the creator of this marvellous tool called Wifi, increasing the value of Opensimulator itself. Today I will test the conectivity of my grid in any public conection like my University or the corner's pub, fix issues and tell you the history. 2-Finish at least six interior rooms of the palace for have a visitable Capodimonte. 3-A good welcome place. (You can see the great tutorial of Maria Korolov for have a good criteria). 4-Prepare good gowns for ladies (good moment to make it with mesh low poly). As you can see, I can't stop nor a moment! Student of History, I'm from Canary Islands in RL. 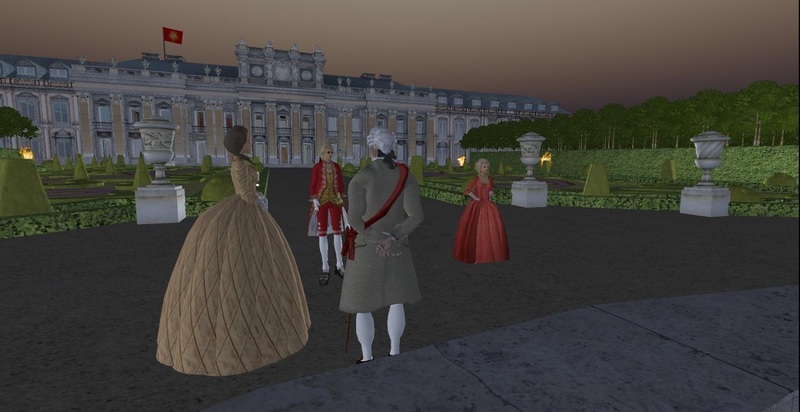 But, loving Europe and his art, in virtual worlds I can be a olden man living in the middle of XVIII century. Feel welcome to this humble blog, I only ask you one thing: Please, forgive my english! Start in Opensim in spanish.